Who will win Saturday's national semifinal games: Oklahoma or Villanova? North Carolina or Syracuse? Our experts weigh in. The Final Four begins on Saturday in Houston, with Villanova tipping off against Oklahoma at 6:09 p.m. and Syracuse taking on North Carolina at approximately 8:49 p.m. Both games will be broadcast on TBS. Below, our experts offer their picks for each national semifinal. Check back on Sunday for championship game picks. Oklahoma over Villanova: We know Buddy Hield can shred defenses with his outside shooting. Once in a while, we see him making plays for his teammates with the ball as well. But what is harder to discern, but is equally effective, is the way Hield makes his teammates better simply by being on the court, even if he does not have the ball in his hands. That’s because he demands such attention from the opposing defense that it creates scoring and driving opportunities for everyone else. Whether Hield can shoot as efficiently in NRG Stadium as he does in a conventional basketball arena remains to be seen, but if he is making shots at anywhere near the level he has in the tournament so far (not to mention the entire regular season) then Villanova will be powerless to stop him. The Wildcats have the edge in terms of balance, defense and overall team toughness. But they don’t have Buddy. In the end, that will be the difference. North Carolina over Syracuse: From a pure personnel standpoint, the Orange have a slight advantage. I count three very likely future NBA players on Syracuse’s roster (Michael Gbinije, Malachi Richardson and Tyler Lydon) to just one on North Carolina’s (Brice Johnson, although Justin Jackson is an intriguing prospect). Still, I will go with the Tar Heels in this one for the obvious reason—that deep frontcourt. You saw how special this group was when they sparked the comeback against Notre Dame after Johnson went to the bench with his third personal foul (an over-the-back call plus the technical). Syracuse’s 2-3 zone is hard to face, but the major weakness of that defense, as is the case with any zone, is it leaves the defensive glass unprotected. Plus, if you could invent a player to operate effectively from the high post (shooting, driving, passing, crashing the offensive glass), it would be Johnson. During the last few weeks, I’ve been skeptical of North Carolina because I didn’t think its guard play was up to snuff. Now it is, and as a result, the Heels will snuff out the Orange's dream of a national championship. Villanova over Oklahoma: I’m not sure if anyone can beat Hot Oklahoma, but I’m skeptical if that version of the Sooners will be present at noted shooting grave NRG Stadium. Villanova’s not the same team that lost to OU at Pearl Harbor on Dec. 7, and the Wildcats’ ability to change defensive looks, implement effective counter-punches in their defensive game plan and never miss free throws in crunch time gives them a chance to grind out a victory. North Carolina over Syracuse: Is the Tar Heels’ offense peaking heading into the Final Four, or have they just lit up a series of bad defenses on their way to Houston? The answer is some of both, but the way they’ve been scoring on the interior bodes well for their chances of carving up Syracuse’s zone. Look for Marcus Paige and Justin Jackson to break down the 2-3 off the bounce, combining for double-digit assists, and post players Brice Johnson, Isaiah Hicks and Kennedy Meeks to finish the job around the rim. Oklahoma over Villanova: This should be a great game—and an even one. I vacillated between the two, even taking time out to make sure I spelled “vacillated” right, and finally decided on Oklahoma for three reasons of varying logic. One: Oklahoma should have more fans there. Two: Oklahoma has played in so many big games this year, against stiff competition, and will not be fazed by the stage. 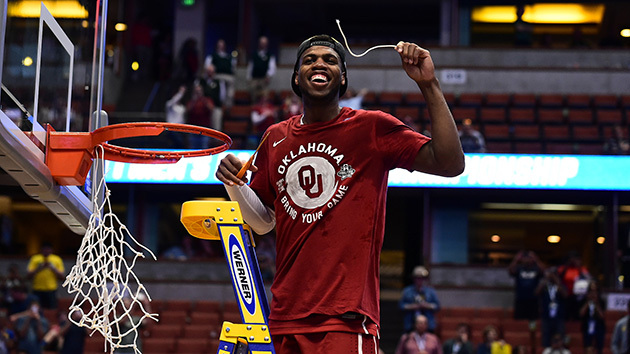 Three, and perhaps most importantly: the Sooners have Buddy Hield, and Villanova does not. North Carolina over Syracuse: The Syracuse 2-3 zone probably won’t baffle North Carolina, which has seen it before. The Orange may frustrate the Tar Heels with their pace, but this game will probably be decided by a five-minute stretch when North Carolina gets hot and Syracuse goes cold. ​Oklahoma over Villanova: In the quiet of the Oklahoma coaches’ locker room in Anaheim after clinching a spot in the Final Four, Sooners assistant Chris Crutchfield had just finished his latest round of disbelief over the latest dazzling performance by Buddy Hield. Then he delved into an overlooked subplot—OU’s dominance in the West Regional. The Oklahoma coaches entered games with No. 3 Texas A&M and No. 1 Oregon expecting taut battles. They ended in blowouts. No team played consistently better in the regionals than the Sooners, who dominated quality opponents, beating the Aggies by 14 and the Ducks by 12. Add a 78–55 blowout of Villanova on a neutral court in December, and it’s difficult to argue against Oklahoma. North Carolina over Syracuse: The Orange are beyond playing with house money. They have robbed the house, foreclosed on the casino and are moving to annex the entire city. Syracuse is the first No. 10 seed ever to reach the Final Four. They did so by stealing two games in the Sweet 16 against Gonzaga and Virginia with a deftly timed full-court press. Of all surreal things, the Orange won with a full-court press. Rest assured North Carolina can’t similarly fold with a big second-half lead. Right? Right? That notion sounds as ridiculous as Syracuse getting here in the first place. The Tar Heels are 9.5-point favorites, and it’s hard to imagine them giving this game away. But there’s just enough bizarre precedent to give you pause, before common sense prevails and you pick UNC to roll by double digits. Oklahoma over Villanova: You could list a few dozen reasons here why the Sooners will top the Wildcats. You could start with the best backcourt in college basketball. You could point to Ryan Spangler, Oklahoma’s top grunt in the post. You could point to quite a few things, but you really only need to point to one guy—Buddy Hield. His performance in Anaheim against Oregon in the Elite Eight—the eight three-pointers, the 37 points—was transcendent. If he shoots like that, if he scores like that, it’s hard to see the Wildcats being able to keep pace. North Carolina over Syracuse: No one outside of the 315 area code thinks Syracuse has any business being in this game, let alone winning it. I tend to agree. UNC forward Brice Johnson should be able to exploit the middle of the Orange’s 2-3 zone, while the suddenly hot guard Marcus Paige should be able to shoot over it. North Carolina is deep and balanced and playing as well now as at any point this season. If Syracuse wins, it will be one of the biggest upsets in NCAA tournament history. Oklahoma over Villanova: There's no glaring mismatch on either side here, with both teams more than capable of matching each other personnel-wise, though the Wildcats (272nd nationally in tempo) would be more comfortable in a defensive slog than the Sooners (89th). The game should be decided by Villanova’s ability, or lack thereof, to make Buddy Hield inefficient. The Sooners’ star guard has averaged 29.3 points per game during the NCAA tournament on just 16.8 shot attempts per outing. He will score, of that there is little doubt. But if the Wildcats can make Hield labor to the points he’ll inevitably get, they can win. Here’s guessing Buddy’s buddies provide just enough secondary scoring to eke by. North Carolina over Syracuse: The backdrop at NRG Stadium might not lend itself to three-point accuracy, and making a few timely shots from deep is essential to busting a zone like Syracuse’s ... but this works both ways. The Orange rely on the three-point shot a good deal—42.3% of their attempts come from behind the arc, currently 39th nationally—while boasting no reliable low-post scoring option. Brice Johnson, meanwhile, should be just enough of a threat in that department to loosen the zone: The North Carolina forward averaged 15 points on 13-of-21 shooting, combined, in two wins against Syracuse this season. And the Tar Heels can deal with a press and run better than anyone the Orange have seen. This should be where Syracuse’s good fortune runs out. ​Oklahoma over Villanova: How much attention should be paid to the Sooners’ 23-point win over Villanova in December? Not too much, as this game looks thankfully like a toss-up. In exorcising their early-exit demons of recent seasons, the Wildcats posted three blowouts to start this year's tournament, then beat a Kansas team that swept the Sooners during the season. Meanwhile, all Oklahoma has is the tournament’s best, most unstoppable-looking player in Hield. Both of these teams can live and die by the three ball: Oklahoma gets 38.9% of its points that way, while Villanova takes 43.1% of its shots from deep. The difference-maker will be the Sooners’ accuracy, which ranks second nationally and has shaken a February slump. Buddy’s guys move on. North Carolina over Syracuse: If you’re a Syracuse fan, the worst part of watching the nightcap of Sunday’s Elite Eight doubleheader was not just that North Carolina won, continuing to look like the well-rounded No. 1 seed they are; it was how the Tar Heels won, with Brice Johnson just about scoring at will from mid- and short-range. If he can find the high-post soft spot in Syracuse’s 2-3 zone, Johnson has the shooting chops and passing ability to be a menace. And though the Heels’ weakness from three doesn’t bode well for zone-busting, they survived iffy outside shooting nights in both of their wins over the Orange this season. They’ll do it again here.